When you think of iconic wildlife of northern Australia, insects might be low down on your list. But when a huge traffic-light red dragonfly lands beside you on a water lily in a billabong, you may reconsider. Australia is quite rich in odonates (dragonflies & damselflies) and northern Australia is particularly so. 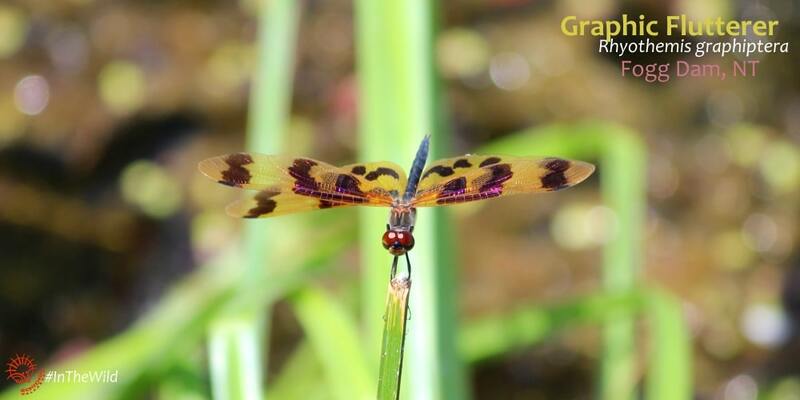 Nearly one-third – 93 of 302 – of known Australian species of odonata occur in Kakadu National Park. 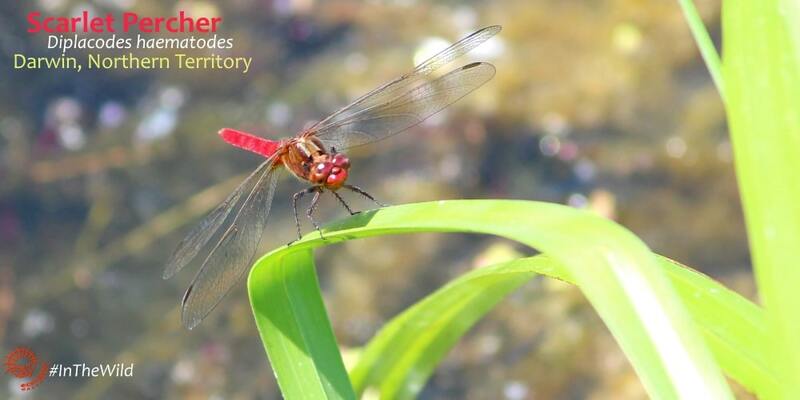 Dragonflies are frequent subjects of photography, and much extra time spent on boardwalks on our Wild Top End tour. Below is a list of our favourite damselflies & dragonflies of northern Australia. This little stunner landed beside us at at Fogg Dam in August 2018. It took all the attention away from the co-operative Graphic Flutterer nearby. Hands fumbled through camera bags in a rush to capture it – we had no idea if this species would stay perched or disappear rapidly. Luckily for us, Rhyothemis phyllis is a fairly sedate dragonfly who flies slowly and perches nicely for photographers. 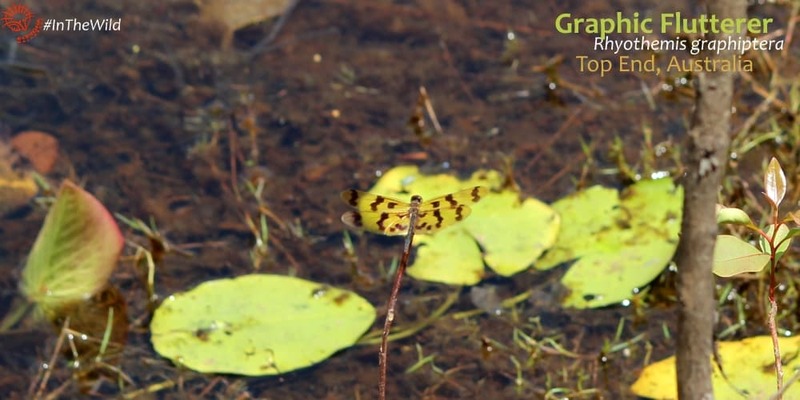 This is the dragonfly we see the most when we visit northern Australia in July, August & September. We have seen them at Fogg Dam, Mistake Billabong, Mary River National Park and in Kakadu. They are so strikingly-marked, and perch so prominently, that everyone remembers them. Hard to miss, bright red all over – when these cuties perch on a lime green water lily leaf it is a photographer’s dream. This is one of our most frequently-seen dragonflies, partly because they are so bright and obvious. We have seen them at Fogg Dam, Mistake Billabong, around Darwin and in Kakadu. Less obvious than those listed above, but one of my favourites. It took me ages to identify this one, as the pictures on my app were of the much plainer female. 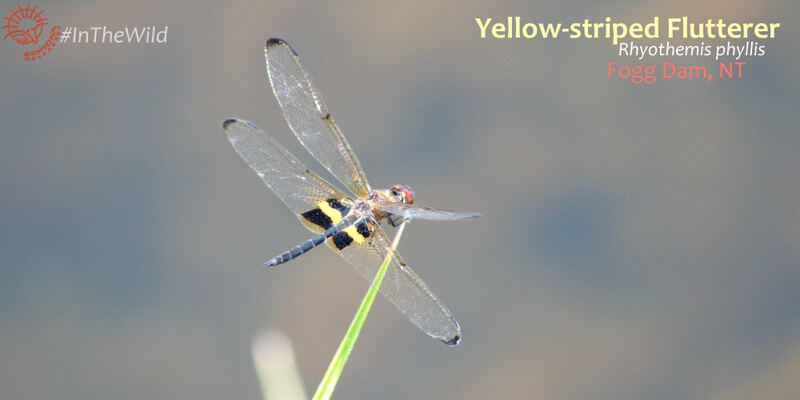 Many dragonfly species display a big difference between male and female colouration. Another regular sighting – but a little harder to see than the Scarlet Percher. 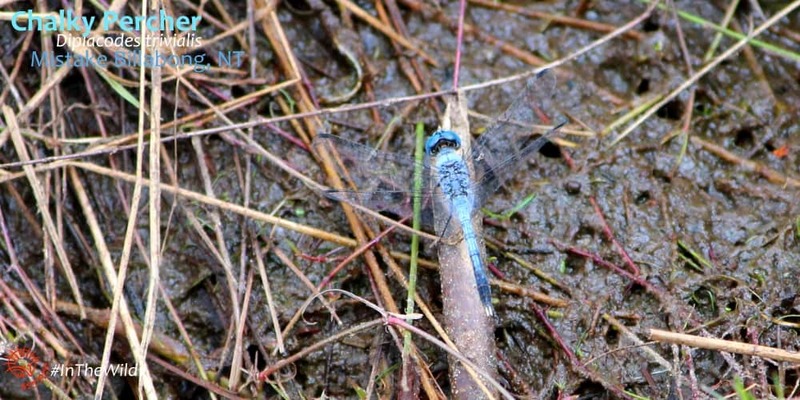 This blue dragonfly is smaller than those listed above, but seems to be quite common in the Top End. The chalky blue colour of males is due to pruinescence*: a bloom caused by wax particles on top of the insect’s cuticle. Adult males become more blue over time. Females look very different to males, with yellow and black markings – so different that I had originally identified a female Chalky Percher as a Slender Skimmer. Dragonflies hold their wings out, like an aeroplane. Damselflies hold their wings parallel along their back. Dragonflies tend to be larger and thicker-bodied than delicate, slim damselflies. 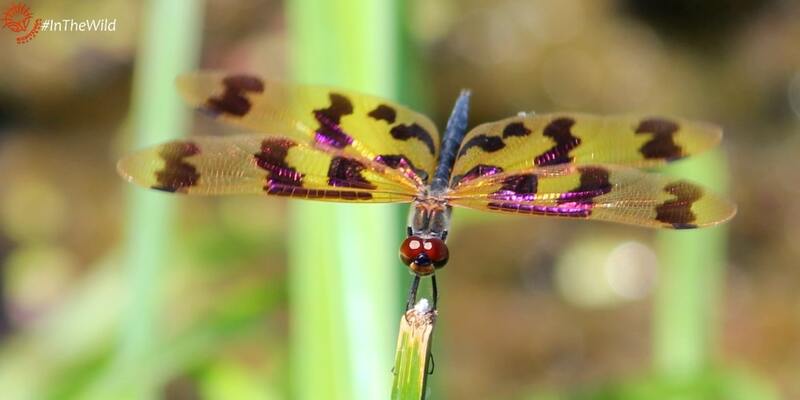 Dragonflies have huge eyes that wrap right around their head. Damselflies still have big eyes, but they have a gap between them. 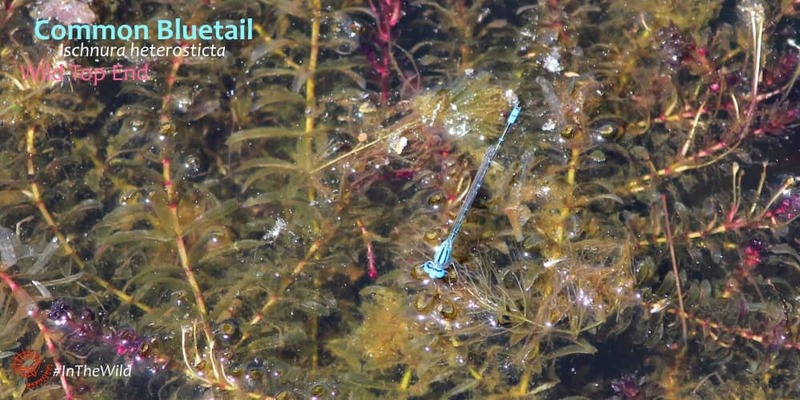 Damselflies are harder to see than dragonflies – this species was tiny, and we only found him while we were looking at dragonflies amongst the water weeds at Fogg Dam, near Darwin. The female is green. These odonates prefer slow-moving water, so the dry season billabongs of northern Australia are a perfect habitat. They do occur right across Australia though, so watch out for them – even as far south as Tasmania. Discovering new interests is one of the many benefits of doing a wildlife tour. You might find you love photography, or rocks or flowers, or lizards or butterflies. Or even dragonflies! Your new interest accompanies you back home, and can enrich your life. We really enjoyed seeing one of our guest’s observations on iNaturalist. Dragonflies have enriched our lives! Read about the butterflies of the Top End here.